Gout is a painful medical condition caused by an excess of uric acid in the body. This can cause repeated attacks of inflammation around joints, with deposits of hard lumps of uric acid being deposited in and around certain joints. These may also occur under the skin, or in the urinary system as kidney stones and the medical term for an elevated uric acid level is hyperuricaemia. It has the dubious distinction of being one of the earliest recorded medical illnesses, once being known as the 'disease of kings and the king of diseases'. Fortunately modern treatments have made this condition readily treatable. The underlying cause - an excess of uric acid in the body - can have a number of causes. Uric acid is a breakdown product of purines which are present in many of the foods we eat such as seafoods, dried peas and beans and some meats such as liver and kidneys. Alcohol may also raise uric acid levels significantly. Gout can therefore be due to increased purine intake through the diet, too little uric acid being removed by the kidneys or - most commonly - an increase in the body's own production of uric acid due to an inherited tendency for this to occur. Gout is nine times more common in men than women, and has a peak age for attacks of between 70 and 75. In women, most cases of gout occur after the menopause. It is more common in people suffering from obesity, high blood pressure and diabetes. What Are The Signs And Symptoms Of Gout? 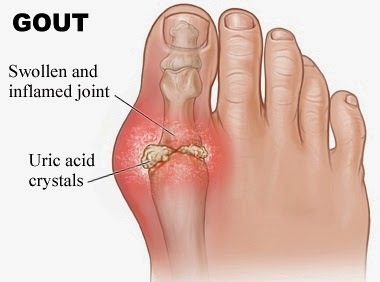 The commonest site for an acute attack of gout is the small joint at the base of the big toe but other sites include the ankles, wrists, elbows and knees. A characteristic attack follows the pattern of a very sudden onset of pain in the joint which then quickly becomes hot, swollen, red and exquisitely tender - even lightly brushing the skin can cause severe pain. There may be an associated fever, and most attacks last hours or days. It is unusual for an attack to last longer than this. Occasionally, crystals of uric acid can become deposited in tiny fluid-filled pockets, or bursae around a joint. This can lead to further pain and inflammation, causing larger swelling - a condition called bursitis. In people suffering from chronically raised levels of uric acid, small deposits of uric acid crystals (called tophi) can be found in soft tissue throughout the body but especially the hands, ears and skin. Will I Have Any Tests Or Investigations For Gout? The ultimate way of confirming an attack of gout is to draw off some of the fluid from around the affected joint (called arthrocentesis) and analysing it under a polarising microscope. The technique is performed under local anaesthetic using a sterile syringe and needle. Under the microscope, uric acid crystals have a classical shiny, multicoloured and needle-like appearance. Blood tests are also often used to check the blood uric acid level, but it is possible to have severe attacks of gout with either normal or even low levels of uric acid in the blood so these results may be misleading at times. There is often no need to perform any investigations as the clinical appearance of a gout attack is often so characteristic the diagnosis can be made on that alone. What Treatment Might I Need For Gout? 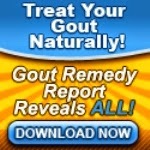 Gout treatment falls into two categories - prevention and active treatment. Active treatment for acute gout attacks are based on the non-steroidal anti-inflammatory group of drugs (NSAIDs) and the commonest one used is called Indomethacin (or Indocid). In the short-term these are usually very safe, but can cause stomach acidity and ulceration if used for a very long time, or taken without food. After the attack settles, they are tailed off and stopped. Aspirin should be avoided during an acute attack, and people with a history of being allergic to aspirin should avoid NSAIDs because of the risk of an intense allergic reaction. In people suffering from repeated attacks of gout, treatment is aimed at keeping uric acid levels normal. The usual drug used to do this is called Allopurinol, taken on a regular basis, and this drug helps the kidney to remove uric acid from the blood more efficiently. It can however actually make an acute attack worse, and so should not be started until such an attack has settled. Popular home remedies include resting the affected joint, keeping it elevated and putting an ice pack on it regularly. Most attacks will settle in a matter of days. With the correct treatment started early, and sensible dietary advice followed, most sufferers begin to feel their symptoms easing almost as soon as they begin their treatment. The key things to do are connected with diet and lifestyle. A low-purine, high-fluid diet combined with a regular exercise programme for weight reduction will stop many attacks of gout from occurring. Many sufferers of gout always make sure they have a supply of Indomethacin in their house so they can begin these at the first sign of an attack, even before they see their doctor. 1. Have you had any such attacks before? 2. How bad is the pain? 3. What is your typical diet? 4. Does anyone else in your family suffer from gout? 5. Do you have a high alcohol intake? 1. Could any of my other tablets I take cause gout? 2. Am I likely to get repeated attacks? 3. What are the side effects of drugs such as Indomethacin and Allopurinol? 4. Am I allowed to work during an attack of gout? 5. Where can I get dietary advice about what to eat?